First off, if you haven’t seen Markdig yet, you’re missing out! It has to be the most extensible Markdown processor I’ve ever seen, and it is still incredibly fast. It’s slim enough to confidently use on small .NET Clients like Xamarin, and supports custom output as well (not just HTML). Because of it’s flexibility and componentization, we are able to customize it without sacrificing performance using their “Extension” framework. The extension we are talking about here is one that ideally would never exist, but solves the problem of malformed Markdown headers. How often do you see wrong headers with the missing space after the “#” in places like Github and WordPress? Well if you’re using Markdig and run into this issue, simply slap this extension into your processing pipeline and worry no more! It even works with a mix of good and bad headers. Check out the unit tests in the source code to view a working example. The gist is a HeadingBlockParser and the Extension itself. /// Bad heading block parser. Does the same thing as the header parser, but doesn't require a space. /// Using a private class to ensure all markdown logic is contained within this service. /// Initializes a new instance of the <see cref="T:Markdig.BadHeaders.BadHeadingBlockParser"/> class. // The optional closing sequence of #s must not be preceded by a space and may be followed by spaces only. Last week I mentioned that I was going to be publishing some of my GitHub library projects on Nuget to make them easier to integrate into your projects – Here’s the newest library for using the Flux in your .NET applications such as Xamarin, UWP, WPF, WinForms, and even ASP.NET. A super simple library to enable the implementation of Flux in .NET Applications such as Xamarin, UWP, WPF, and more. It contains some base level Flux components to help you get started with your implementation faster. Flux is a design pattern created by Facebook with the purpose of creating robust data-driven UI components and handles the flow of data between components and outward to services. Stores are responsible for containing and managing data for a single domain or data type. Stores listen to the dispatcher for certain events and use the data from the dispatcher to update their data, handle errors, and then pass that update down to the components that are subscribed to the store. Actions are responsible for piping events through the dispatcher. Actions are invoked from Components or from background processes. They can also handle some small business logic such as data mapping or talking to external services. Components are the UI and UI logic layers. They are responsible for displaying views to the users and for handling user events. They invoke Actions and subsribe to Stores to handle updates to the data. A single dispatcher is responsible for the Pub/Sub mechanism of events invoked from Actions. Stores subscribe to events by name through the Dispatcher. How does it work with MVVM and data binding? ViewModels can be considered part of the Component layer but are separated from the actual UI/Views. This means that the ViewModels are responsible for invoking Actions, and subscribing to Stores. The Views themselves are only responsible for showing the UI and communicating to the ViewModel. The FluxToolkit is available on Nuget: https://www.nuget.org/packages/FluxToolkit It has no external dependencies and should work with any .NET Standard library or project including Xamarin, Xamarin.Forms, UWP, WPF, and even WinForms. It has not been used for web application development, but it is compatible with ASP.NET projects. Use the StoreBase class from the FluxToolkit to implement your unique stores for your different data types. It contains a generic Data field based on the TData type you pass into the definition. Now you don’t have to worry about communicating to the dispatcher for pub/sub – simply call the base methods for Subsribe and Unsubscribe. Ensure that you are not using multiple instances of your Stores, but rather should be using either a Singleton or Inversion of Control with Dependency Injection to pass the implementation of your Store to the Components that require it through the constructor. Constantly creating new Stores can cause memory leaks due to the event subscriptions. /// Processes an event from the dispatcher before emitting it. Create an Actions class for each of your main data types. These actions will call to the Dispatcher to fire events and will also need to implement IActions in order to properly handle the pub/sub mechanism. For each of your data types, you’ll need to define some ActionTypes which translate to the id or name of the events your Actions are invoking through the Dispatcher. Have your components subscribe to the Stores that are appropriate for the data need, and invoke the Actions they need. This is a great place to place inject your Stores and Actions into the constructor of your Componentswhether it is through a ViewModel or an Activity, ViewController, or Xamarin.Forms.Page. Want to add additional examples or more tooling to help people develop their apps with Flux? Fork this repository and create a pull request! A strong and scale-able architecture is important in applications, especially in Mobile Apps. APIs and SDKs are constantly changing, new technology is constantly released, and team sizes are always changing. A solid Onion Architecture can save a development team a lot of time by making it simple to change service implementations, restrict access to certain areas, making logic flow easy to follow, and making testing isolated blocks of code easier. In this section, we will talk briefly about building useful tests for our solution, and why the Onion pattern makes it easy to break tests out into individual layers. In this example, we will add a test project whose purpose it to just test the Business layer within our Infrastructure. In our project, we also want to install MvvmLight, just like in our Client and Platform layers. We will also need to add references to our Domain.Models, Domain.Interfaces, Application.Models, Application.Interfaces, and Infrastructure.Business projects. Now that we have some mock implementations, we can set up our tests against our Business logic. Now we can test against any of the business logic in our application with a mock layer. The same practice can be applied to test any other layer in the solution as well. The data layer can be tested by mocking the business layer, and so on. Looking back at all of the components of our Onion Architecture, one might think, “Wow, that’s a lot of code to do a simple task”. It’s important to remember that this architecture is not for every project. It’s focus is on scalability and testability. If your project has the potential to grow into something quite complicated, with many developers involved, this type of solution might work best for you. However, if you’re working on something quick to get out the door, maybe getting right to the point is easier and best for you. The best parts about the Onion Architecture are its abilities to make drastic changes to tools or services used, without having to rewrite anything but that components implementation as well as making it easy to test individual layers without affecting the others or using real data. It also allows for closer monitoring and management of the codebase; keeping people from making calls directly from one layer to another. The only thing you have to emphasize is, “Are you adding a reference to another project to get something done? If so, you might be doing it wrong”. In this section, we will look at how to expand our Inversion of Control container with platform specific code. Specifically, we will implement some pieces of the HockeyApp SDK so that we can make calls to it from our Client or Infrastructure layers. Our example will focus on just Android, but the same principles can be applied to any of the unique platform projects. First thing we need to do is make sure we also install the MvvmLight nuget package in your Android project, as well as the HockeyApp Xamarin package. Setting it up generic like this allows us to switch providers from HockeyApp to some other service should that be a need in the future. Back in our Android project, let’s implement the ICrashAnalyticsServicewith our HockeyApp logic. Now we can create an IoCConfig class specific to our Android project. Because SimpleIoC uses a singleton for its container, we can register classes in our platform specific classes before our registrations in the Client layer. Don’t forget to add a reference to the Application.Interfaces project in your platform project. Now we can make calls to our ICrashAnalyticsService from the Client layer, and use the Android specific logic. For example, we can pass the ICrashAnalyticsService into the constructor of a ViewModel, and call the GetFeedback() method to get access to the HockeyApp Feedback view. It’s all that simple! The same pattern can be applied to anything that needs to be platform specific. In the next and final segment, we will look at building mock implementation of our Infrastructure layer and using them to test layers individually in Unit tests. In this section, we will look at the code for our actual Xamarin.Forms client implementation along with talking about building other Non-Xamarin clients into our solution, and sharing as much code between them as possible. This are our Client layer, and will include setting up our Views, ViewModels, IoC container, and start up process. First thing is first, let’s build our ViewModels. These ViewModels are going to interface with our Application layer by making calls to our defined Service Interfaces that will be injected into the constructors of our ViewModels. Some things to note: We are using MVVM Light in this example to make our MVVM and IoC easier to get going. So things such as the ViewModelBase class and the Set() method are coming from that library. You can choose to utilize a different library, or roll your own pretty easily. In either case, the principles are the same. Notice how we injected the IUserService in the constructor, and use that to lazy load some data into our bindable properties. When we create our view and set the BindingContext to this ViewModel, we will see the UI automatically update when those do. This example does it async right from the constructor, but you can load your data and set up your initial properties any way you’d like. The next step is to initialize our Inversion of Control, Dependency Injection, and ViewModelLocator to tie all our layers together and allow us to automatically set the BindingContext of our Page. If it makes sense to you, you can break the IoC set up into a separate project that references all the previous layers. For the sake of simplicity, we are going to do it in the same project as our Xamarin.Forms project. The purpose of this class is to wire up our dependencies as well as our actual container for the ServiceLocator. This example is using SimpleIoc which is packaged with MVVM Light. Now that we have our other layers glued together, we just need to create our ViewModelLocator to automatically handle our bindings, then make calls to the IoCConfig when the ViewModelLocator is initialized. In our constructor, we initialize our IoC, and also provide properties for each of our ViewModels, so that we can bind it easily in our XAML. The last two steps here are to add a Resource in our App.xaml to our ViewModelLocator, and create our Page. Now that we have our resource, let’s create our page and wire up the BindingContext in our XAML. There is nothing required to write in our code behind (MainPage.xaml.cs) since it is all automatically wired up. At this point, we should be able to run the application (assuming that the Xamarin.Forms app is started off in each platform the way the template sets it up). 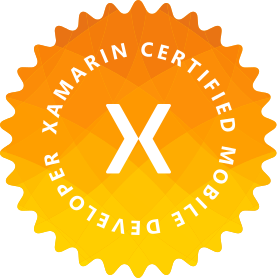 So we have our Xamarin.Forms implementation. But what about other applications that can’t use Xamarin.Forms? Web apps? Xamarin.Mac apps? Cloud apps? WPF? Here is one of the coolest parts of the entire Onion pattern. We can go ahead and add more projects into our Client layer. These layers can use the same models, interfaces, and in some cases, implementations! For projects where we would need completely different logic, such as a Web App for example, we can implement multiple versions of the Domain and Application layers. In our web app, we could create another project in the Infrastructure layer (say Infrastructure.WebData) that uses Entity Framework and SQL. Then in our IoCConfig of our Web App, we call to register our Infrastructure.WebData implementations for our Domain.Interfaces. As long as each project in the Client layer serves the same purpose of configuring Views, and starting up our application with our Inversion of Control, any type of application can live here and follow the same pattern. The Client layer can also contain abstractions of controls or other utilities that can be referenced by the core Client projects. In the next segment, we will look at how to integrate our individual mobile platforms, and how to inject custom platform-specific code with some examples using the HockeyApp SDK.